Are you looking to Buy a 2019 Manufactured Car ? Alphabetical Meaning: For Instance 10th Letter of Chassis Number Denotes Year of Manufacturing for Hyundai / Honda / Renault etc. If its J - it depicts 2018 Manufactured Car and if H will represent 2017. 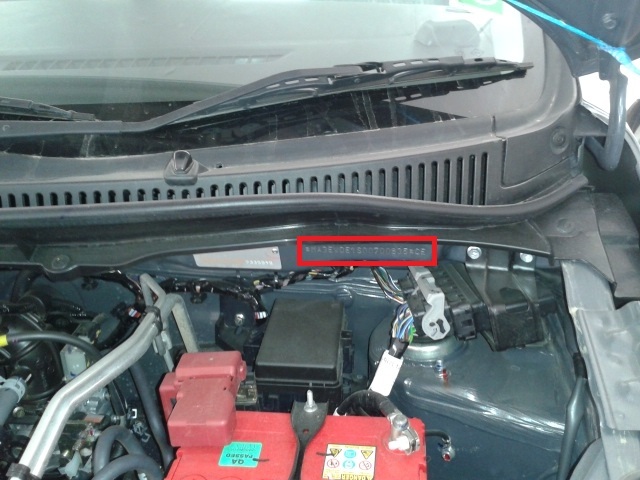 10) Maruti Suzuki Nexa Series (Ignis, Baleno, S Cross, Ciaz), New Dzire, Brezza - If 10th and 11th Characters are Zero or 11, then check Engine bay for last 2 VIN Digits after 17th Digit x sign. Last Digit indicates Year of Make. Note: Toyota, Ford, Other Maruti Suzuki Regular Cars and Chevrolet are Exceptions out here. 13) In Toyota: Etios, Altis, Innova, Fortuner: its a 21 Digit VIN a combination of 20th n 21st Letter (in Numeric Terms) makes up for the manufacturing year. Like 11 for 2011, 12 for 2012 and 13 for 2013, 14 for 2014 and same way 18 for 2018. 14) In Ford: Figo, Aspire, Ecosport, Endeavour 11th Letter will denote year of Manufacture. 2. Maruti Suzuki Nexa Series of Ignis, Baleno, S Cross, Ciaz or New Dzire, Brezza - 11th Letter Denotes Month (For instance if its A it means January make, if its D it means April make). If 10th and 11th Characters are Zero or 11, then check Engine bay for VIN Digits after 17th Digit x sign and Second Last Digit indicates Month in which Car is Manufactured. Note: Some Car Dealers will either give you 17 Digit or short Chassis Number. Its best to look at complete VIN Chassis number by checking physically in the car - Engine Bay / Under Seats / Window Panels etc - to find complete VIN Chassis number for decoding it as 2014 or 2015 Car. 10th digit K and 12th digit is B...So its Feb 2019!!! right??? My nexon arrived 10th digit K and 12th digit is B...So its Feb 2019!!! right??? I bought a new car in February 2019 but after that I only check the vin number which manufacture in 2018. Is this a matter to me? I felt that I was been cheated. What can I do? Hi, I bought a new car in February 2019 but after that I only check the vin number which manufacture in 2018. Is this a matter to me? I felt that I was been cheated. What can I do? Pl. Give me a manufacturing date. VIN MALA851CLJM781596 Pl. Give me a manufacturing date. I want to perched a car. Suift vxi or i10 sportz. which car the best Velu for many in 2018.. I have booked a Renault Duster RXZ 110 PS on 29-09-2018 which is MEEHSRCFFJ8004834 number on it. What could be it manufacture year and month? Plse suggest. I got the Chassis no. of my Tata Tigor car MAT629276JKJ85236. What is the month and year of mfg? JM in Ford means July 2018 . Looks OK if the vehicle condition is OK when you do a PRI (pre-registration Inspection) at dealer stock yard (insist for atleast 2 PRI) and once dealer completes his PDI in his workshop, do another round of PDI youself try to drive it for 10-15 KMS and be very attentive. MA3FDEB1S00356244 this vin number owner is Sara D.. Can not found this number why...? Hyundai car's VIN no is 17 digit not 19. How could I check manufacture month? my chasis number is MALA851CLJM841350. I understand the year of manufacture is 2018. But what is the month of manufacture?